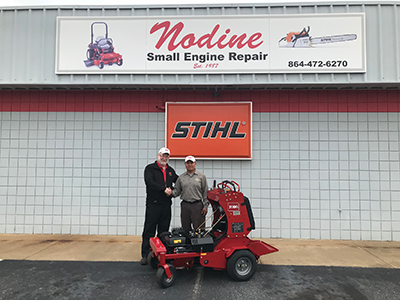 Jose Arroyo of Jose’s Lawn Service and Landscaping in Lyman, S.C., winner of Toro’s 2017 GIE+EXPO Giveaway, has taken delivery of his new 24-inch stand-on aerator just in time for spring. Arroyo’s new 24-inch stand-on aerator fits through a standard 36-inch gate. Reaching ground speeds of up to 6.5 mph, the aerator also optimizes power and hydraulics to ensure consistent core depths regardless of terrain. Additional features include a hydraulic valve to adjust operator weight, as well as electronic depth control to maximize power to aerate. When aerating, operators will notice consistent plug depths of up to 5 inches in length. Arroyo picked up his 24-inch stand-on aerator from his local Toro dealer, Nodine Small Engine. The Davey Tree Expert Co. was ranked in Forbes’ Top 500 List of Best Employers in America for 2018. Forbes’ Best Employers ranking includes two lists: one for the nation’s largest companies with more than 5,000 U.S. employees and one for midsize companies with 1,000 to 5,000. With more than 9,000 employees throughout North America, Davey was ranked 294 on the Forbes Best Employers list for large companies. Forbes partnered with a market research company to compile the list. They asked 30,000 people how likely they would be to recommend their employer to others, and they were also given the opportunity to nominate other organizations. Greenworks Commercial and Edney Distributing Co. have entered into an exclusive partnership to benefit independent lawn and landscape dealers throughout six midwestern states and one Canadian province. Through the arrangement, Edney Distributing Co. will provide distribution, logistics, service and sales support for both the Greenworks Commercial 82-volt system and the newly launched Greenworks Elite 40-volt system, among independent dealers in Minnesota, Wisconsin, Iowa, North Dakota, South Dakota, the Upper Peninsula of Michigan and Manitoba, Canada. Since 1951, Edney Distributing has been the trusted choice of dealers in its region for supplying a wide array of high-quality lawn and garden, agricultural, forestry and light industrial equipment with service and support. With the addition of the Greenworks Commercial and Greenworks Elite lines to its portfolio, Edney Distributing will now offer dealers the industry’s broadest line of lithium-ion, battery-powered outdoor equipment. The offering of Greenworks Commercial and Greenworks Elite systems is now available through the Edney Distributing dealer network. Monster Tree Service is expanding to St. Louis. Investor and Real Estate Executive Tim Sansone has purchased the rights to a Monster Tree Service territory in the St. Louis area through his Stone Acres Investments. Sansone was awarded the territory in January and began operations April 1. Sansone has brought on Cory Smith as the general manger to run day-to-day operations. “Cory is the type of guy I envisioned from the beginning to run daily operations. He is honest, hardworking, smart and passionate about the tree industry,” Sansone said. In other Monster Tree Service news, the company is expanding to South Florida. Business entrepreneur, Adam Kanter, has purchased the rights to the Monster Tree Service territory in Palm Beach, Fla. Kanter was awarded the territory in January and will be launching in late spring.